Sunnysyrup Food Co., Ltd. is a manufacturer, supplier and exporter of Tapioca Balls. with several years of experience, We produce our products with well-equipped testing equipment and strong technical force. Our company has passed the evaluations of some certificates. About some brand and models. If you are interested in more informations about our products, please feel free to contact us, we'd be glad to talk with you in details! Grenadine Flavor Conc. Juice is dark red color, sense of elegance as if it's a luxury jewelery. it's one of the rare kinds of fruits flavor to be made into syrup. Popping Boba-Grenadine Flavor Coating Juice is in bright and smooth surface. When biting the boba, grenadine juice is flowing out into your mouth. Sweet grenadine juice makes various kinds of tea appreciation. Regardless of extract tea or fruity tea, adding Popping Boba-Grenadine Flavor Coating Juice could be perfect fusion. lifting the spirits and with lasting aftertaste. 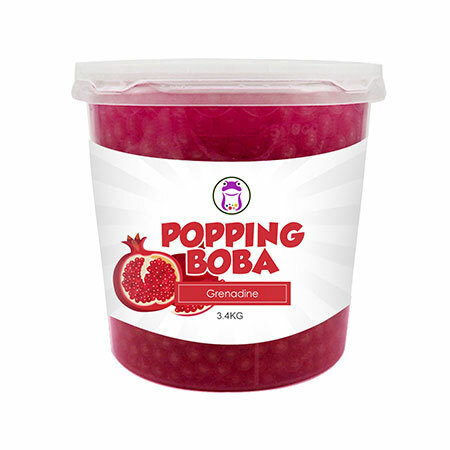 Popping Boba-Grenadine Flavor Coating Juice is made of Grenadine Conc. Juice, suitable for various of drinks and as topping for frozen yogurt.